I've updated my Well MB01 and thought I'd share in case any one wanted to do the same. I bought the gun from Taiwanguns.pl for £78 with Piston upgrade, scope and silencer. 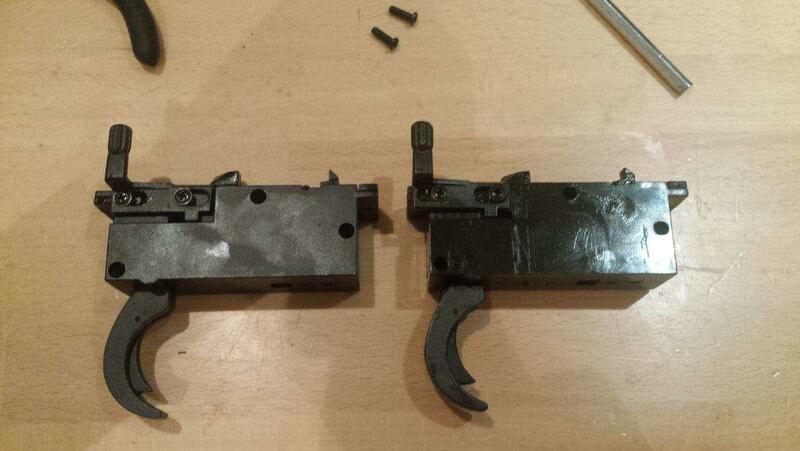 I bought grease and Barrel Spacer from airsoft sniper parts UK, and metal Trigger box from ebay from China. The easiest job was replacing the piston and spring guide, lots of YouTube videos for that, I cut down the spring by 2 coils as I wanted this to be roughly under 450 fps, as lots of sites stated this was shooting in the range of 460-470 fps. I'm not able to tell what the fps differences are as I don't have a chronograph as yet. I still have the 500 fps spring that came with the upgrade kit just in case I cut it too short. 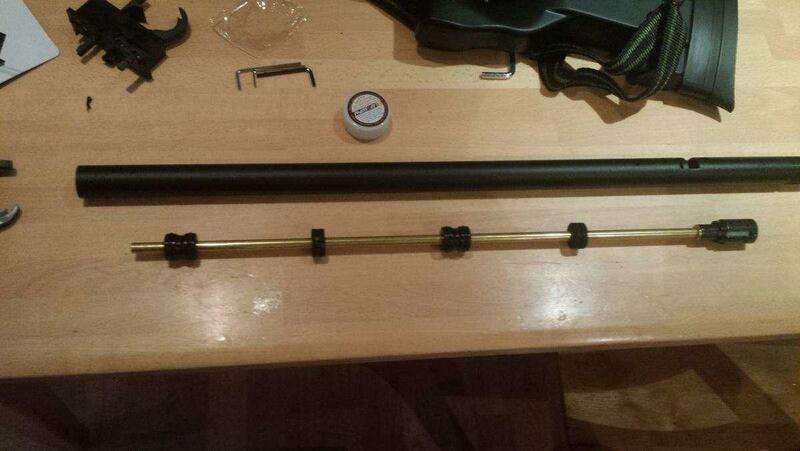 Next part was removing the barrel to put the spacers I bought from airsoft sniper parts, again youtube has lots of vids on this and I've attached a pic of what it looked like. The foam spacers where already attached to the barrel and I used them again as they were a good fit, but did move position when I fitted the barrel in so getting 4 spacers would of done a better job than 2. I have heard from reviews that the spacers add a small amount to accuracy and as it was only £9 I thought I'd give it ago. Last was the trigger box, I had heard of the MB01 trigger box spitting and it was also recommended if you used a higher spring it was recommended to use one. So I spent £22.50 from ebay for this. It added some extra weight but I hope this will last ages. I didn't bother with upgrading the barrel, I've seen reviews for the tight bores and people prefer wider bores for sniping, so I left that for another time when I want to play with the hob up. Pic of the trigger boxes, metal box on the left. If you're using a more powerful spring that mech won't help - it's just a metal outer-casing. The sears are what hold the spring back and those are made from a similar pot metal. Yeah, I've seen the sear on airsoftsniperparts, they're not cheap. I'm only using the spring that came with it at the moment. I think this was mentioned in the other thread, but ASPUK just resell stuff (a lot of it Airsoft Pro) at a huge markup. Do intense Googling for anything airsoft and don't just stop at the first retailer you find. Pretty good choices for a first upgrade. Except for that the first upgrade should have been the hopup unit. Action Army is the best choice now IMO. You don't really want more power, you want accuracy. That gives the useful range. Wide bore barrels are just a fashion thing. They became popular 2-3 years ago but no actual evidence that they are better than tightbores. The "air cushion" or "BB rides along the top of the barrel" are unproven theories. The precision of the barrel is what really matters. With the recent batches of crap heavy BBs a wider bore is certainly better. I personally believe in 6.03-6.04 barrels. Really serious snipers (veterans on airsoftsniperforum) use tighter bores. Assume you mean 6.03 - 6.04 or OP is gunna have trouble finding those, heh. I'd also note that many people have also found wider bores to be more consistent. There's no evidence that either make much of a difference over the usual benefits you get from having a good cut over your stock barrel, but that's just airsoft - very few people bother to properly test anything. Again, as you say the finish is far more important than the diameter anyway. I've also seen just as many people on those sniper forums using wider bores, but I'd agree with you that 6.03 - 6.05 is a good place to go for not least because wide bore inexplicably cost a lot of money right now. The only other reason I'd go for a wider bore is because they're less affected by residue from say biodegradable BBs, but that's also not really an issue in sniper builds. Oh, yes. Cheers. Fixed it.